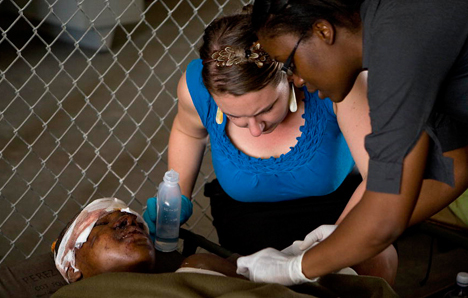 U.N. staff members treat a survivor of Port-au-Prince's earthquake. Photos courtesy of UN/Logan Abassi. United Methodists have raised more than $1 million for relief work in Haiti. The donations to the United Methodist Committee on Relief will support its efforts to respond to those most in need following the devastating Jan. 12 earthquake. An estimated 2 million to 3 million people need immediate assistance. In a statement, Bishop Joel Martinez of the United Methodist Board of Global Ministries, UMCOR’s parent agency, said he was thankful “for the overwhelming generosity,” but encouraged further gifts. "This is heartening but needs to be multiplied many times over,” he said. “We believe that contributions to UMCOR at worship on Sunday (Jan. 17) will be a powerful testament to the love of United Methodists for those in crisis." UMCOR staff was expected to arrive in the Dominican Republic sometime over the weekend. The agency’s emergency response efforts will be coordinated with a variety of partners, including Church World Service, Action by Churches Together, Global Medic, Muslim Aid and the Methodist Church of Haiti. The Rev. Lloyd Rollins, a United Methodist pastor and former UMCOR executive who now works for the Washington-based International Relief and Development, was hoping to be in Haiti by Jan. 16. Donations to UMCOR will support those in need following the earthquake. Church World Service had two staff members arriving in Haiti, according to the Rev. John McCullough, a United Methodist who serves as its top executive. The agency has sent funds to local partners in Haiti. Another partner agency in the Dominican Republic is sending kits and blankets to Haiti from its warehouse in Santo Domingo, and will assist with getting other aid into Haiti. Stop Hunger Now, the Raleigh, N.C.-based food organization, has become a focal point for gathering resources for Haiti, says the Rev. Ray Buchanan. “We’ve got a 747 (jet) full of aid to go out on Sunday,” he added. United Methodists in Virginia are setting up “packaging events” to stockpile more meals, he reported, and the denomination’s Mississippi Conference is arranging for every district to hold packaging events throughout 2010 for Haiti relief. “The church is responding in a wonderful way, showing initiative to make sure something happens,” Buchanan said. Although it is too early to send volunteer teams, UMCOR is encouraging church members to collect health kits for distribution in Haiti. UMCOR Sager Brown is coordinating a shipment of health kits to provide individuals with basic necessities. Instructions for assembling and shipping health kits are available here. 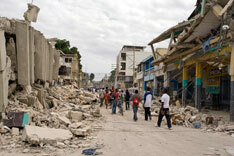 Gifts to support UMCOR's Haiti Relief efforts can be made to Haiti Emergency, UMCOR Advance #418325. Checks can be made to UMCOR with "Advance #418325 Haiti Emergency" in the memo line. Checks can be put in the church's offering plate or mailed to: UMCOR, PO Box 9068, New York, NY 10087. The entire amount of each gift will be used to help the people of Haiti.